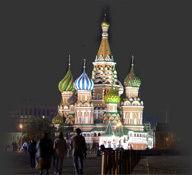 the invitations and advice needed for you to easily obtain your visa to Russia. simple for you, and give a pictorial answer to these questions. What is the appearance of a visa which is stuck in your passport? What is a Tourist Invitation? What cities is my visa for? Each answer will open a new window. This information is appropriate for most Russian Embassies and Consulates. (some Embassies now have an on-line form). Issued to your friends in Russia by the OVIR/PVD/FMS. Issued by a company registered with the Ministry of Foreign Affairs. of the Ministry of Foreign Affairs and the company. applying to. Hotel vouchers alone are not acceptable. 3 month double-entry; 6 or 12 month multi-entry. processed by the MofFA, with the official reference number* on it. from the Ministry of Foreign Affairs in Russia. Transit visas Maximum period 72 hours. for the country of entry and exit from Russia is required. Check with the airline about the requirements. Finland or Israel must send details of their Insurance with their visa application. documents, check with the Embassy you will be using if unsure. a revised FORM, check with the Consular Department where you are applying. Russian Embassy's Consular Department where appropriate. You must have an official invitation in order to apply for a visa. NEED AN INVITATION? see Tourist and Business Visa Support page. Visa Consular fees. There is an extra fee payable for the visa, and possible other fees. given to the Russian Embassy's Consular Department where appropriate. ** Please check with the Russian Consular office that you will be using for the current fees. OR the Embassy may require the original documents from Russia.